The official Korea World Cup 2014 jersey. 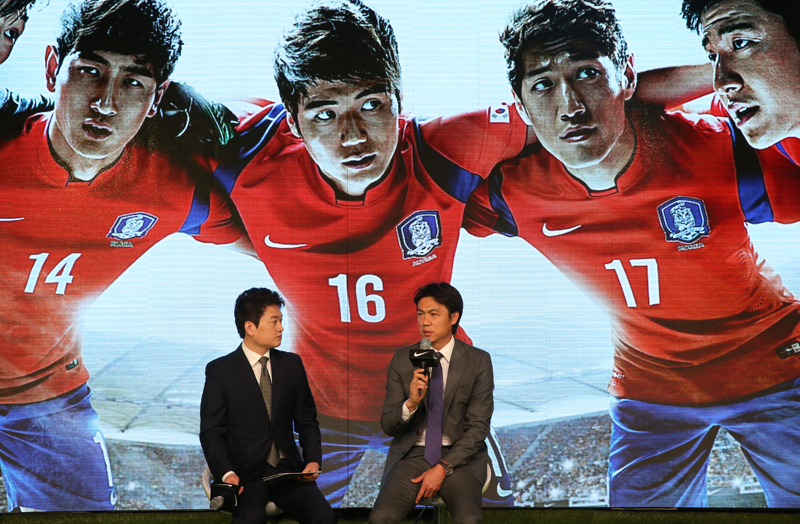 Nike and the Korea Football Association debuted the home jersey that will be worn by the Korean National Soccer Team at the 2014 FIFA World Cup. Nike was inspired by the Taegeuk (the yin and yang symbol in the middle of the Korean flag). The Taegeuk is comprised of negativity and positivity and trying to live a life that is balanced and harmonious. The jersey is a symbol of the Taegeuk’s spirit. The new elements of the jersey include opposite vertical blue stripes on the shoulders, the collar is a throwback to classic Asian collars which were pared-down and streamlined with no button, is made from recycled materials, and on the inside of the jersey is the Tuhon symbol written in Korean. The Tuhon symbol means “fighting spirit.” This is very appropriate as a Korean cheer at sporting events is hwaiting, which is a mispronunciation of the English word fighting. 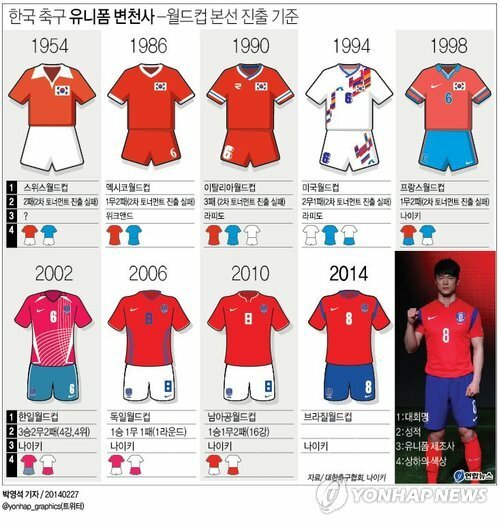 The look of the Korean soccer uniform from 1954 to 2014. Korea National Team Manager, Hong Myung-bo, speaks to the crowd at the unveiling in Seoul. Nike has taken Brazil’s summer climate in consideration when they made the jerseys. Brazil’s average temperature in the summer is between 25-30 degrees Celsius with some regions reaching the 40’s, the humidity can be between 58% (mildly humid) to 99% (very humid), and the air is very dry. “Since the climate in Brazil is hot and humid, the breathability of the new uniform is about 10 percent better than the previous one worn during the 2010 World Cup in South Africa.” announced Nike’s Lee Jang-hwan. During the Greece friendly on March 6, the Korean Men’s Team showcased the jersey which brought some luck with Korea winning the match 2-0. Park Chu-young and Son Heung-min scored both goals. Park Chu-young scored the first goal of the match at the 18th minute against Greece. Korea will not be wearing the home jersey against Russia on June 17 because Korea is considered the “away” team; however they are considered the “home” team for their match against Algeria and will debut the jersey on the World Cup stage on June 22, 2014 in Porto Alegre, Brazil.